Pale - An area enclosed by a fence or boundary. As in... "Within the pale, we began to see the beginnings of a copse, a thicket of plants looking much like a grove initially that will never begin to be large enough to be a forest." 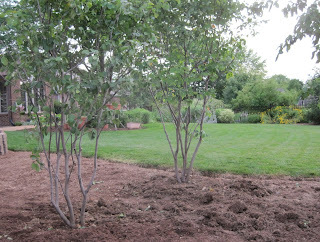 When fully planted, it will be a destination in the garden with a path through plantings leading to it and a bench nestled within it providing a place to sit and rest and think about definitions of landscape terms like copse or anything else that comes to mind. 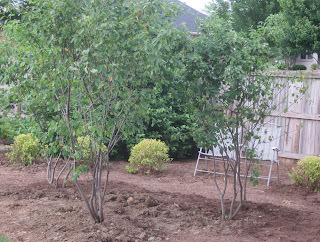 Spiraea japonica 'Limemound', recycled from the front landscape. 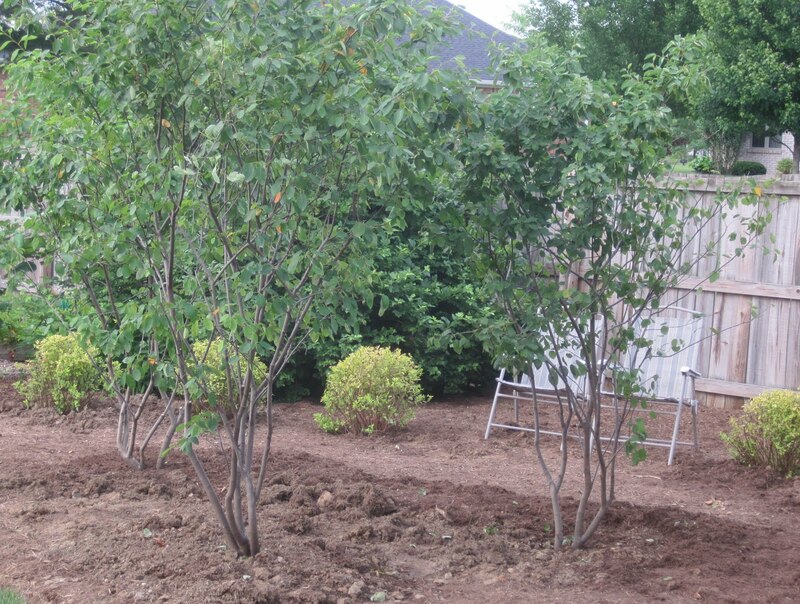 With these trees and shrubs in place, the largest bed in the garden begins to take shape. Find a nice bench for seating in the copse. 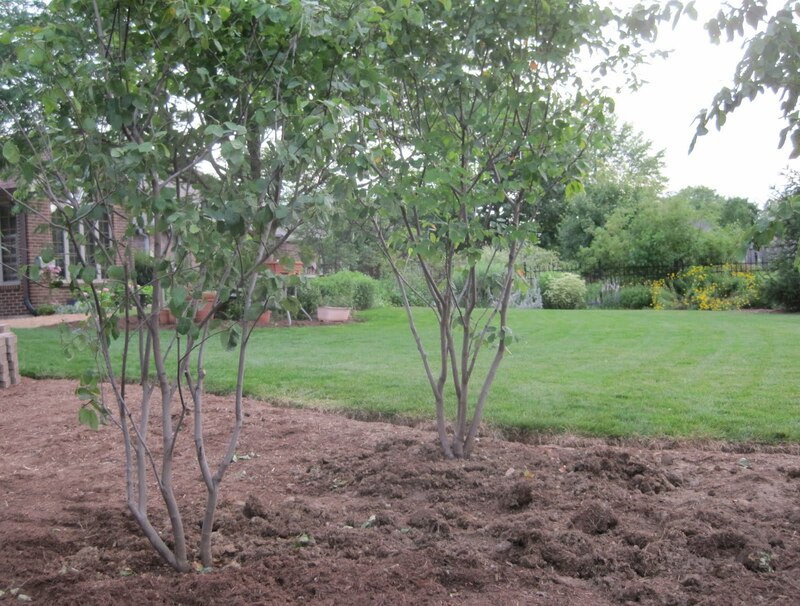 Consult with garden designer on additional plantings in the back yard and to layout the path through the copse garden. Get serious about a gate design for the vegetable garden. Look for a fountain for the patio. Watch the night blooming cereus bloom, which really has nothing to do with the garden design, but it does have a great big flower bud on it and I think it should bloom in a week or so. 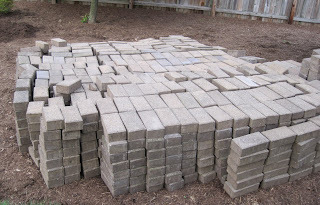 I am drooling over those bricks.Lots of fun in store! Pale was a mew word for me (in the use anyway) So what is that a homonym? I am in awe of the beautifully crafted sentenced that did require me to reread quite a few of the definitions. I am so very impatient. We've been in this house only since March and still I want the trees we just planted 2 weekends ago to already be 15 feet tall! I like your plan tho. Wonder if I can carve out a spot? Coming along nicely, it is. It's all so exciting. I'm enjoying watching the reformation of your garden. Thanks for the lesson on landscape terms. It's weird how many place names around here have "Grove" as part of their name. Your plan looks so well researched and thought out that I'm sure you'll end up with a beautiful sitting area once everything fills in. It made me think of a restaurant I found a few weeks ago...they had converted an old alleyway into a goregous promenade flanked by climbing ivy on both sides with sitting areas underneath shaded by wrought-iron trellises. Hope to see more businesses go that route in the future! Yes, I appreciated having all those definitions, too. The 'Autumn Brilliance' is wonderful in spring, too. I like this post Carol, very education, informative and fun! Can't wait to see the fountain you find for the patio. Thanks for making me look up copse. I am enjoying peeping over your virtual fence to see everything that's going on in here! I'm probably one of the few gardeners to attempt a thicket, to provide shelter for wrens. I deliberately planted some Bursaria spinulosa together, but unfortunately the plant's so leggy that the thicket never really developed properly. Back to the drawing board!